Petrified Forest National Park, named for its high concentration of rainbow-colored petrified wood, is located in Apache County and Navajo County in northeastern Arizona. The fee area of the park covers approximately 230 square miles and it almost 30 miles long from north to south. The park receives around 650,000 recreational visitors each year for sightseeing, photography, hiking, and backpacking. 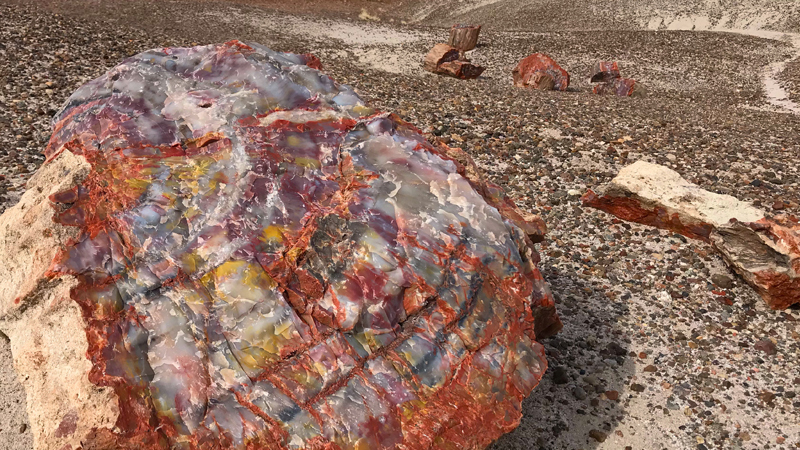 The southern part of the park is known as the Rainbow Forest because tons of rainbow petrified wood, from small shards to massive trunks, are spread across the landscape. Here you’ll find trails like Giant Logs, Long Logs, Agate House, Jasper Forest, and Crystal Forest, that wind through ancient log jams of petrified wood that will take your breath away. The middle of the park, where the Puerco River passes through, was home to the Anasazi and a natural travel corridor for other tribes, traders, and travelers. Here you’ll find the petroglyphs of Newspaper Rock and Puerco Pueblo, the ruins and petroglyphs of an ancient Puebloan Village. You’ll also find Blue Mesa Road and the Blue Mesa Trail that pass through gorgeous blue and purple Painted Desert badland formations. The North End Of The Park: Even though all of Petrified Forest National Park sits with int he Painted Desert, the northern part of the park is known as the Painted Desert area. Here you’ll find eight incredible scenic overlooks, the Tawa and Painted Desert Rim Trails, and the Painted Desert Inn, a historic 1930s adobe building with Hopi murals. No matter what area of the park you visit, you can rest assured that you’ll be treated to spectacular desert landscapes and vividly-colored chunks of petrified wood that all but demand a closer look! Seeing all of the amazing sights in Petrified Forest National Park is easy because all of the best things to do are easily accessible off the 28 mile main road that connects the north and south entrances of the park. If you’re speedy want to maximize your visit, you can do everything on this list in one day. Or, if you’re traveling with kids and like moving at a little slower pace (and wearing them out) you can spend two days in the park and check out one of the seven maintained hiking trails — Painted Desert Rim, Puerco Pueblo, Blue Mesa, Crystal Forest, Giant Logs, Long Logs, and Agate House — that vary in length from less than 0.3 miles to almost 3.0 miles. 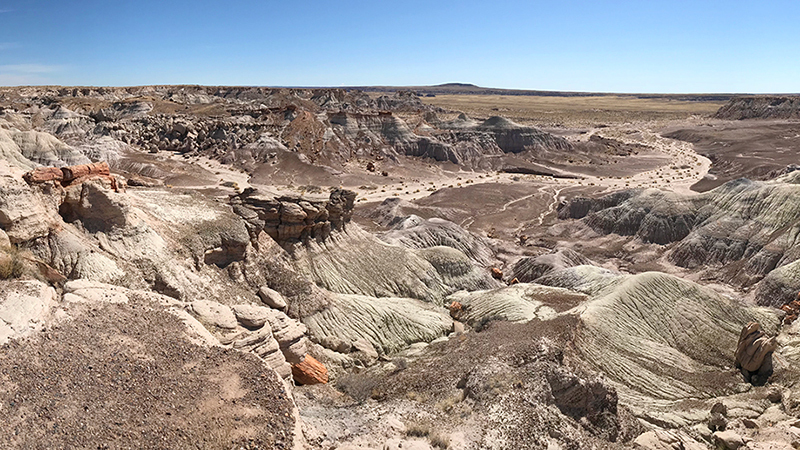 Here is our list of the best things to do at Petrified Forest National Park, and for your convenience, they’re listed in order from the southern park entrance near Holbrook, Arizona all the way to to the northern park entrance, so you won’t miss anything! At the Rainbow Forest Museum And Visitor Center, you can learn all about petrified wood, watch an movie about the park, chat with park rangers about things to do, check out museum exhibits chronicling the area’s geologic and human history, view displays on the reptiles and dinosaurs that once inhabited this region, and get park maps and information. Located behind the Rainbow Forest Museum and Visitor Center, the Giant Logs Trail features some of the largest and most colorful petrified logs in the Petrified Forest National Park. Giant Logs Trail is a 0.4 mile, easy, paved loop trail where you can see giant, rainbow petrified logs, including Old Faithful, which weighs 44 tons and measures almost 10 feet across its base and 35 feet long. Long Logs Trail is a 1.6 mile lollipop loop trail that leads through the site of a Triassic-period log jam, where some petrified log specimens measure over 100 feet long. Agate House Trail is a 2.0 mile round trip trail that leads to a reconstructed multi-room pueblo made of petrified wood. Both trails can be combined for one incredible 2.6 mile hike. Crystal Forest is an easy, paved, 0.75 mile, loop trail through a badland landscape with many intact petrified logs whose quartz crystals sparkle in the sun. The Crystal Forest Trail provides one of the best opportunities to see a huge collection of stunning petrified wood deposits all in one place. Plus, the fossilized trees and crystalized wood in this area have an unusually high concentration of additional quartz and amethyst crystals inside the trees! Jasper Forest Overlook provides a breathtaking panoramic view of desert terrain covered in a high concentration of rainbow petrified wood. Jasper Forest was the first petrified forest discovered by western settlers and a short, accessible path leads from the parking area right to the scenic viewpoint and observation platform where you can look out over the valley strewn with petrified wood. Agate Bridge features sweeping views and a 110 foot long petrified log bridge spanning a gully. Originally, the massive petrified log sat on the ground, but centuries of flood waters and erosion washed out the gully beneath the petrified log to form a natural agate bridge. Blue Mesa Road is a short, 3.5 mile, scenic lollipop loop road and the best short drive in Petrified Forest National Park. There are seven roadside pullouts along the loop road and at each one, we were blown away by the views of eroding funky-shaped sandstone formations, large pieces of golden petrified wood, the blue and purple striped badlands, colorful hills and buttes, desert washes, and giant boulders. Blue Mesa Trail is a moderate, paved, 1.0 mile loop trail with an elevation change of 120 feet. After a short walk along the top of the mesa, the trail descends quickly into the Blue Mesa Basin and the stunning, mostly-flat Painted Desert badlands. Here you’ll walk through blue, purple, white, green, and grey striped hills, cones, and buttes dotted with rainbow petrified wood. Named for their cone-like shape and similarity to Indian dwellings, the Tepees showcase the cool striated colors of the Blue Mesa Member dating back 220-225 million years. Newspaper Rock features the largest concentration of petroglyphs in Petrified Forest National Park, displaying more than 650 petroglyphs, some more than 2,000 years old. The petroglyphs can been seen from an overlook above the rocks. Puerco Pueblo is the largest archaeological site in Petrified Forest National Park. It features the partially excavated ruins of an ancient Puebloan village built by the Anasazi over 600 years ago and over 800 petroglyphs incised on more than 100 boulders. 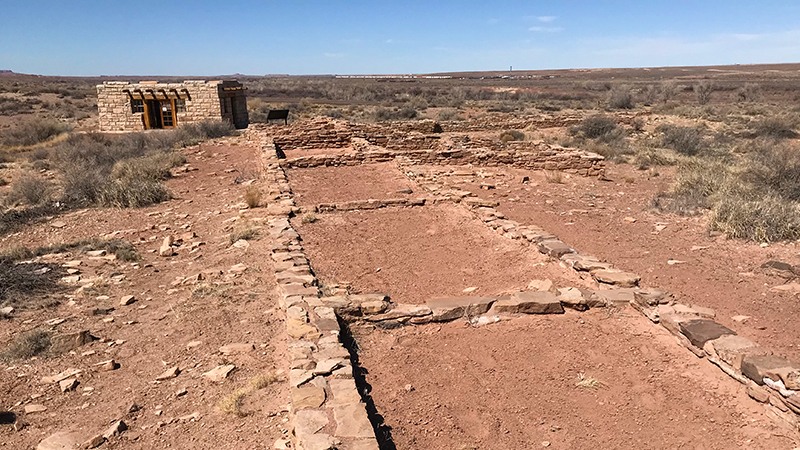 The Puerco Pueblo Trail is an easy, paved, 0.3 mile loop trail highlighting the petroglyphs and ruins of Puerco Pueblo. Petrified Forest is part of a natural travel corridor that has been used for over 10,000 years and historic Route 66 is its most famous road! The often-photographed 1932 Studebaker is part of a Route 66 Monument that also includes a vintage car themed concrete bench and a line of historic telephone poles showing the original Route 66 alignment through the park. The stunning views at Lacey Point include the Lithodendron Wash, a normally dry river that stretches to the south. The viewpoint is named for Iowa Congressman John Fletcher Lacey who strongly advocated for the protection of public lands and the resources within them. From Whipple Point you’ll have a fantastic view of the 12,633 foot tall San Francisco Peaks more than 100 miles away. Whipple Point is named for Lieutenant Amiel Whipple who passed through this area in 1853. On his expedition, Whipple named the seasonal river you can see from this viewpoint Lithodendron Wash, from the Greek words meaning stone tree. Nizhoni means beautiful in Navajo, and the name is perfect for Nizhoni Point, which offers breathtaking views of the broad drainage of Lithodendron Wash coursing across the bold reddish colored and layered badlands far below. Pintado Point is the highest elevation scenic overlook in Petrified Forest National Park. At this scenic viewpoint, you actually get a 360 degree view of the surrounding multi-hued Painted Desert badlands reaching more than 100 miles! At Chinde Point in 1984, fossil bones of an early dinosaur, the Chindesaurus Bryansmalli, were first discovered! The Chinde Point Overlook and Picnic Area has covered picnic areas, water, and restrooms. Kachina Point is one of eight Painted Desert scenic overlooks in Petrified Forest National Park and the location of the Painted Desert Inn, which was designed in the Pueblo Revival architecture style with detailing reflective of the patterns and motifs of local Native American cultures. From the lookout at Tawa Point, you can see the black basalt of the Bidahochi Formation that forms the rim of the plateau you’re standing on. Tawa Point is also the starting point for the Tawa Trail and the Painted Desert Rim Trail. Named for the Hopi corn goddess symbol, Tiponi Point provides views of the pink, red, brown, and orange hills of Arizona’s Painted Desert. In stark contrast to the blue skies overhead, the colorful rolling hills, mesas, and buttes will take your breath away. At the Painted Desert Visitor Center, near the northern park entrance, you can get park information, watch a movie about the park, learn about historic architecture, and talk to a park ranger. You’ll also find restrooms, a gas station, a restaurant, a bookstore and gift shop with tons of souvenirs, and an outdoor picnic pavilion. Petrified Forest National Park is located in Petrified Forest, Arizona 86028 in both Navajo County and Apache County. Admission is $20.00/automobile and $10.00/bike/motorcycle/person and it is good for seven days. Petrified Forest National Park offers free admission days on Martin Luther King Jr. Day, the First day of National Park Week, National Public Lands Day, and Veterans Day. Petrified Forest was designated a National Monument in 1906 and later became a National Park in 1962. The park’s elevation varies from a low of 5,340 feet along the Puerco River to a high of 6,230 feet at Pilot Rock. The average elevation is about 5,400 feet. Petrified Forest National Park actually closes! The park is open daily year-round from 8:00 am to 5:00 pm. When staff permits, extended hours go into effect from 7:00 am to 6:00 pm or maybe even 7:30 pm — and they’re not kidding. The park gates actually close and half-an-hour before, rangers drive the main park road telling you to wrap it up and start heading out of the park. The Painted Desert Visitor Center and Rainbow Forest Museum And Visitor Center are open daily from 8:00 am to 5:00 pm year round, with extended hours as staffing permits. Check out one of the seven maintained hiking trails — Painted Desert Rim, Puerco Pueblo, Blue Mesa, Crystal Forest, Giant Logs, Long Logs, and Agate House — that vary in length from less than 0.3 miles to almost 3.0 miles. Bicycle use is permitted on paved park roads and parking areas open to the public. Bicycle use is not allowed off-road or on park trails, with only a few exceptions. Picnic Shelters are located at Chinde Point, Rainbow Forest, and Painted Desert Visitor Center. Petrified Forest is one of the most animal friendly national parks. You can bring your leashed pet any place you are allowed to go except into the buildings.